In the article Definition Determinants have explained how to calculate the matrix determinant for a matrix of 2 x 2 and 3 x 3 using the Sarrus method. 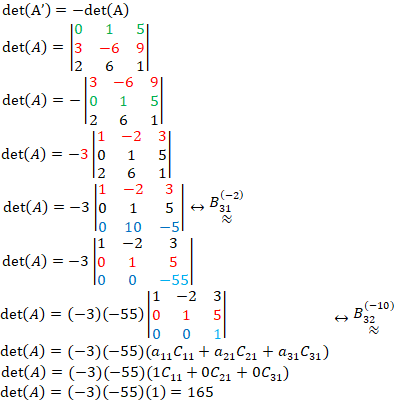 In this article we will show how the determinant of a matrix can be calculated using cofactor expansion and elementary row operations. 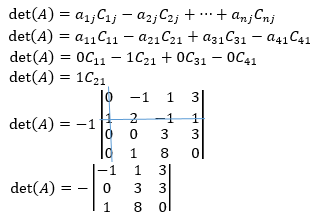 If A is a quadratic matrix, then the ai minor entry is expressed by Mij and is defined as a fixed submatrix determinant after the row-i and Column-j are crossed from A. Numbers (-1)i+j Mij is expressed by Cij and is called the cofactor entry aij. A quick way to determine whether the use of the "+" or "-" sign is the fact that the use of a sign that connects Cij and Mij is in the row-i and column-j of the arrangement. For example, C11 = M11, C21=-M21, C12 = -M12, C22 = M22, and etc. Equation (**) shows that the determinant of A can be calculated by multiplying the entries in the first row A with the cofactors and increasing the product of the multiplication. 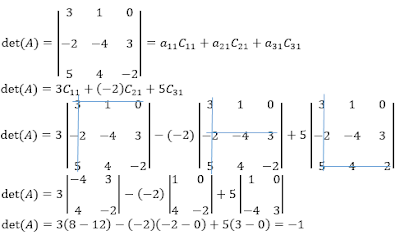 This method of calculing det (A) is called a Cofactor Expansion along the first row A. 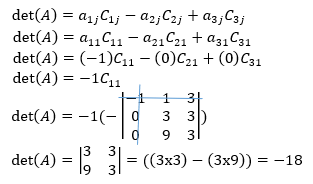 Calculate the determinant of matrix A with the Expansion method along the first row. Note that in each equation all cofactor entries come from rows or from the same column. This equation is called the Cofactor expansion expansion det (A). Let A be the matrix in example 2. Calculate det (A) using a cofactor expansion along the first column. Cofactor expansion and row operations or column operations can sometimes be used together to provide an effective method for calculating determinants. By adding the corresponding multiplication from the second row to the rest of the line, we get. Add - (the value of row-i column-1) second row to the other row to get the method as in the example calculation method of Gauss.hitungan Metode Gauss. In cofactor expansion, we calculate det (A) by multiplying entries in rows or columns with their cofactors and adding the resulting multiplication results. 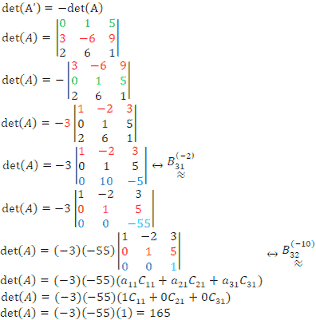 It turns out that if we multiply the entries in a row with the corresponding cofactors from different rows, then the sum of these multiplication results is always equal to zero. Named a cofactor matrix A. Transpose matrix is ​​called adjoin A and is stated with adj(A). In this section we will show that the determinant of a matrix can be calculated by reducing the matrix in the form of row echelons. This method is important to avoid the length calculations involved in applying the determinant definition directly. Proof, because the elementary result marked with A contains one factor from each line A, then each marked elementary product contains a factor of the zero number row and consequently will also have zero. Because det (A) is the sum of all elementary times marked, we get det(A) = 0. We do not need further reductions, because if the matrix of squares has two comparable lines, like the first row and the second row of matrix A in Example 7 above, then the determination is zero. The next theorem shows how elementary row operations on the matrix will affect the determinant value. Let A be any matrix n x n.
If A' is a matrix that results when two lines A are exchanged, then det (A') = - det (A). If A' is a matrix that results when a single row A is multiplied by a constant k, then det (A) = k det (A). If A 'is a matrix that is generated when multiples of one line A are added to another line, then det (A') = det (A). If A is a triangular matrix n x n, then det(A) is the product of entries in the main diagonal, namely det(A) = a11a22...a33. 1 Response to "Rules for Calculating Determinants"
Thanks for sahring. This post help me.